388-390 Commonwealth is located on the south side of Commonwealth, between Massachusetts Avenue and Charlesgate East, with 386 Commonwealth to the east and 400-416 Commonwealth to the west. 390 Commonwealth was designed by architect Edward B. Stratton and built in 1908-1908 as a seven story hotel, the Hotel Puritan, for boot and shoe manufacturer and real estate investor William Ball Rice. He and his wife, Emma Louise (Cunningham) Rice, lived in Quincy. He is shown as the owner of 390 Commonwealth (shown as 398 Commonwealth) on the original building permit application, dated August 24, 1908. The building was built on two lots, one with a frontage of 100 feet at 394-398 Commonwealth, which William Rice’s Avenue Real Estate Trust acquired from the estate of Henry Lee in early 1908, and the other with a frontage of 90 feet at 388-392 Commonwealth which the Trust acquired from the estate of J. Malcolm Forbes in mid-1908. The two transactions were reported in the Boston Globe on January 29, 1908, and July 1, 1908, respectively. The building occupied a frontage of 130 feet, leaving a vacant lot to the east at 388 Commonwealth with a frontage of 60 feet. The lot at 388 Commonwealth remained under the same ownership as 390 Commonwealth, and was vacant until 1957, when a parking lot was installed for use by the Hotel Somerset. The parking lot was replaced by an eight story building in 1983. 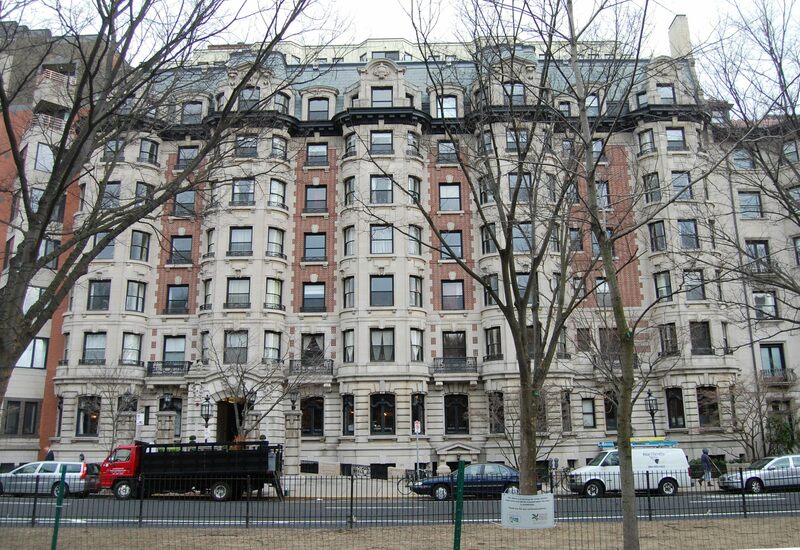 In his Houses of Boston’s Back Bay, Bainbridge Bunting incorrectly indicates that a six story, six family apartment building, designed by Arthur Vinal, was built in 1899 at 388 Commonwealth. The application to which Bunting refers was for 386 Commonwealth (which he also lists, correctly) and was for only one building at 386 Commonwealth. 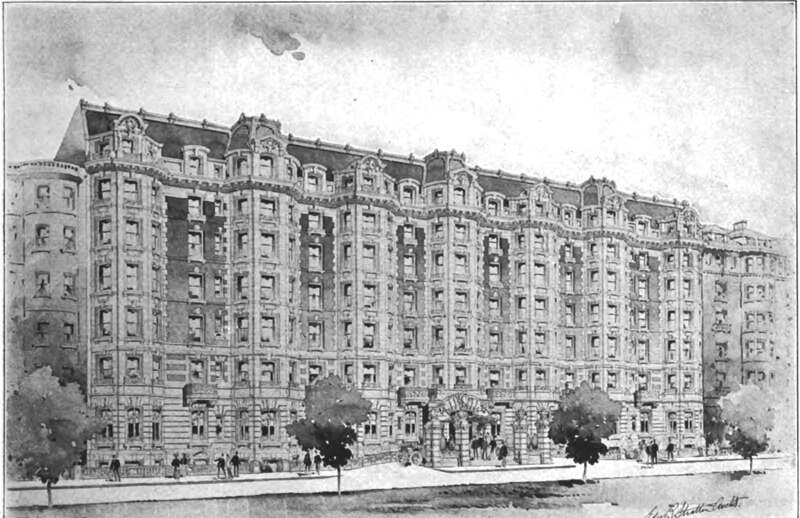 The Hotel Puritan opened in November of 1909. 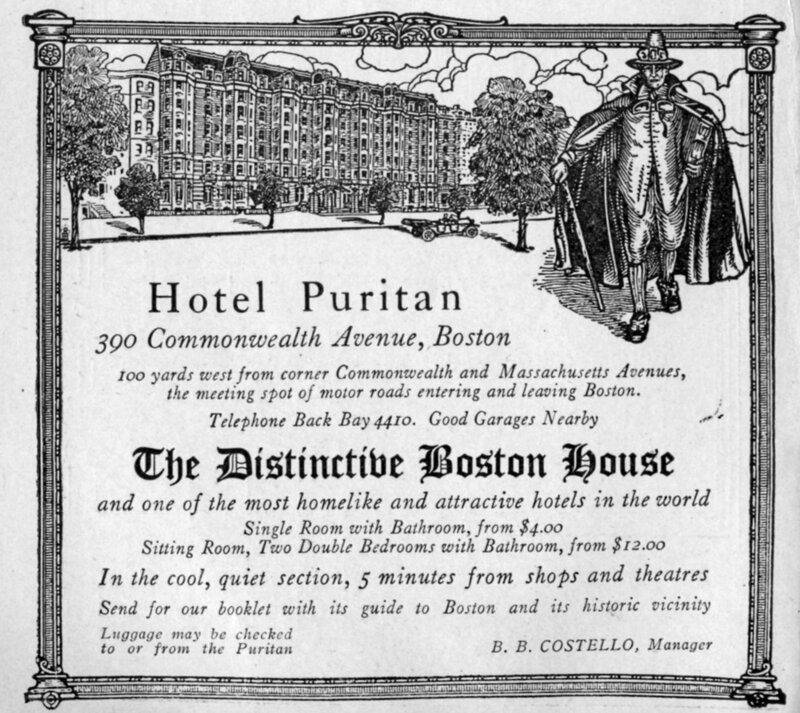 Like The Somerset to the west and the Hotel Vendôme further east on Commonwealth, the Hotel Puritan accepted both travelers and permanent guests. William Rice died in May of 1909, before the Hotel Puritan opened. It continued to be owned by the Rice family through its Avenue Real Estate Trust. 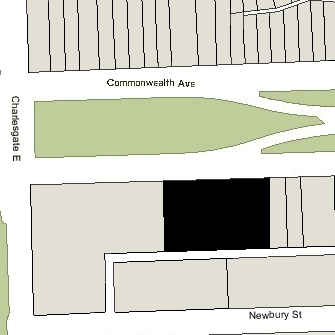 John D. Hardy, trustee of the trust, is shown as the owner of 390 Commonwealth (including the vacant lot at 388 Commonwealth) on the 1912 and 1917 Bromley maps, and Harry L. Rice (William and Emma Rice’s son) et al, trustee of the trust, on the 1928 and 1938 maps. In 1952, the Hotel Puritan was absorbed by the Hotel Somerset and the two were operated as an integrated property by Sonnabend Operated Hotels, which became the Hotel Corporation of America in 1956 (in 1979, it became Sonesta International Hotels). In 1972, real estate developer Pasquale Franchi purchased the Hotel Somerset. His company, Somerset Building, Inc., remodeled the buildings, converting them from a hotel into 187 apartments, a night club, shops, and offices. The entirety of 390 Commonwealth was devoted to office and commercial space. 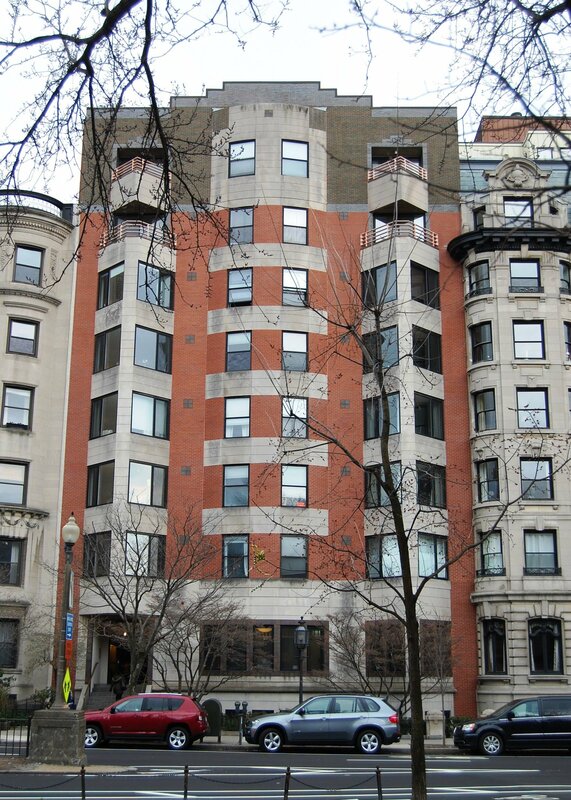 In March of 1983, Frederic W. Rust, trustee of the Puritan Investment Trust, purchased 390 Commonwealth from the 400 Commonwealth Avenue Apartments LP. The purchase included 390 Commonwealth and the vacant lot at 388 Commonwealth, and an interest in the Somerset garage on Newbury. In September of 1983, Frederic Rust received permission to remodel 390 Commonwealth into apartments and to construct a new building on the vacant lot. The new building, designed by architects Bruner, Cott & Associates, was eight stories plus a basement and was connected to 390 Commonwealth. The basement and first floor of both the original building and new building were designated for office and commercial use, with apartments on the upper floors. The lease for the Aku-Aku Restaurant, located at 390 Commonwealth, was purchased so that its space could be remodeled for office use. The remodeling of 390 Commonwealth and the new building at 288 Commonwealth were not completed until 1986. In October of 1985, Puritan Investment Trust applied for (and subsequently received) permission to establish the occupancy of 390 Commonwealth as 91 apartments, swimming pool, and general offices. 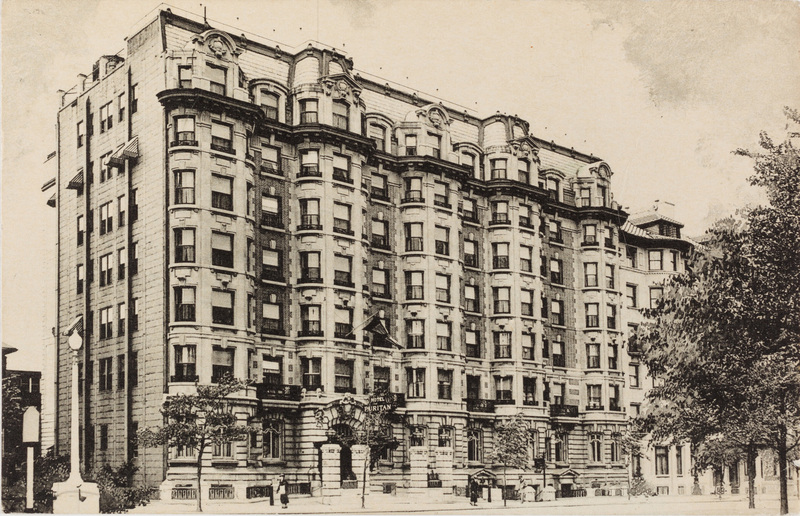 In April of 1986, the Puritan Investment Trust converted the building into 91 residential units and 4 commercial units, the Windsor Place Condominium.